I'm in awe right now. 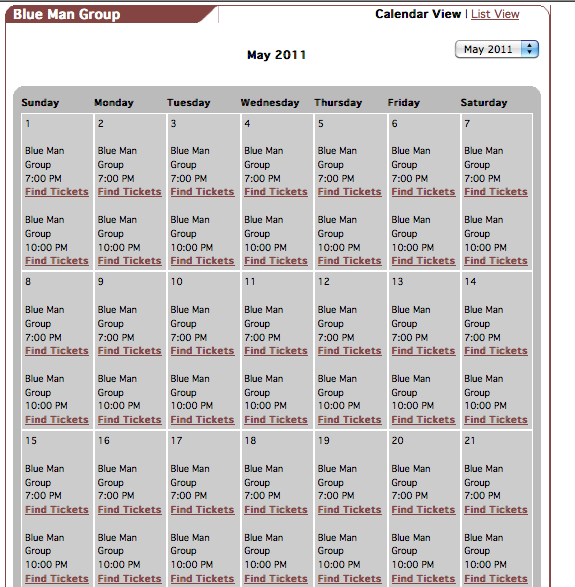 A press release just came over announcing that Blue Man Group will leave The Venetian and heading for Monte Carlo in fall 2012. That's 2012. Twelve. It's astonishing news for a number of reasons. 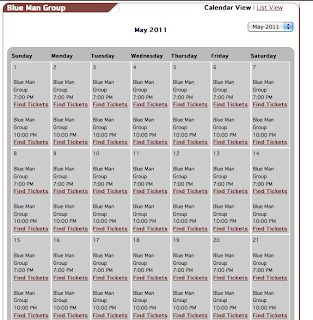 First, BMG started out at the Luxor in 2000, then moved up the street in 2005 to The Venetian. Now, after nearly six years there, they've found a third home and it happens to be back in the original fold, MGM Resorts. I'll have to go back and look, but I thought the Luxor gave them up to make room for Criss Angel, so that would have been a MGM decision and not some remainders of the pre-merger Mandalay regime. So BMG appears to be one of the most indestructible brands in Vegas history and that's funny because nobody ever really talks about them. I can't think of another production of this scale that has hopscotched through three major Vegas resorts. Keep in mind, this is a show with a rotating cast that presently does two shows a night every single night. Somehow, nonetheless, it keeps trucking along even as other productions cut and alter their schedules because of the economy. * When does BMG depart Venetian? The release doesn't say and tickets remain on sale through this May. * What becomes of Jabbawockeez? Does this imply it's not doing so great? * Does this ascertain that the Cirque-Michael Jackson sitdown production will land at Mandalay Bay, as has been expected ever since The Lion King's departure at the end of 2011 was announced? There's really no place else left for it other than Excalibur or Circus Circus, right? I suspect BMG will be much happier at Monte Carlo where, as was the case at Luxor, it can be the dominant, most visible attraction on the property. At Venetian, it was one of so many productions and the resort was only nominally involved in promoting it. MGM Resorts takes a much more hands-on approach to that and, really, there's not much else happening at the Monte Carlo. I also predict that BMG will be heavily marketed as a sort of second-show for neighboring CityCenter, which has 6,000+ rooms across three hotel-ish buildings and just one theater option. At the same time, it gives those folks two bombastic (in a good way) options and nothing more mature or sedate. So perhaps it'll be Madness At The Monte Carlo? Can't you see that on the inevitable building wrap? When BMG left Luxor, not long after the then-named MGM Mirage acquired Mandalay Bay Resorts, which owned the Luxor, there were rumors in the industry that MGM wanted only Cirque du Soleil concepts in their showrooms. I don't know if that was the real reason why BMG left, but I am of the opinion that it was indeed because of being from the "pre-merger Mandalay regime." I think it is a win-win situation for both parties. Yes, I predict the demise of Jabbawockeez. I have never seen that show, but the promos make it look like a BMG wannabe or a low budget BMG. Frankly, if you are going to spend your money on that type of show, I suppose most people will spend it on the McDonald's of the genre, BMG. I think BMG endures because it's one of the only "family friendly" shows in Vegas. Really. Cirque shows are fine, but kids love that BMG stuff. I support Blue Man Group my kids love their shows! They're really family friendly and must! I was speaking to one of the band members at a recent show (Febuary 11th 2011) and he told me that the show's going to be a completely new one. Considering that they're more popular than ever at the moment (Five shows in America plus one touring show, one show in Germany, a European touring show and a show on the Norwegian Epic cruise ship backs this statment up, I feel), I can only imagine that MGM didn't hesitate to get BMG into one of their casinos.